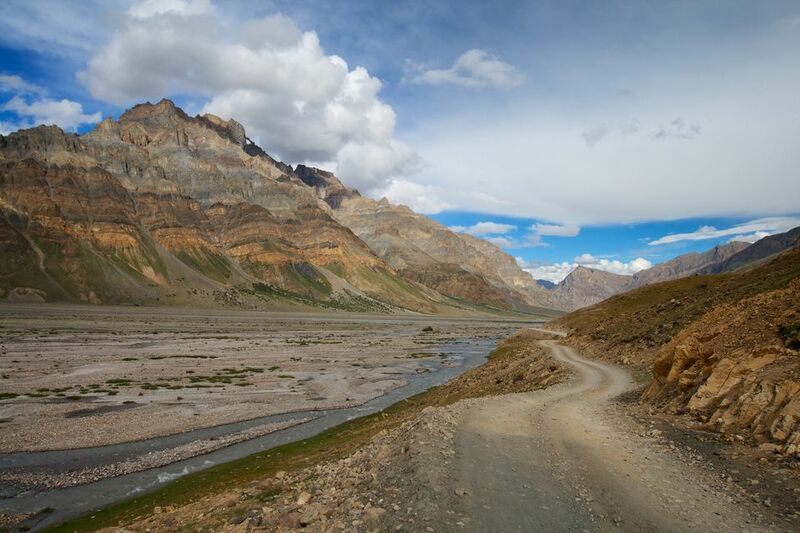 The 200 kilometers (125 miles) road from Manali to Kaza in Spiti, India is filled with spectacular ever-changing scenery. From the densely forested hills of Manali to the rocky barren planes and peaks around Chattru, and the sweeping snow covered mountains surrounding Kunzam Pass. As these photos show, it really is a visual feast that ensures you'll never be bored of the journey. The route is popular with motorbike enthusiasts and trekkers alike. Facilities along the way are minimal, with roadside dhabas serving basic food to hungry stomachs. Don't expect to find many toilet facilities either. In this region, calls of nature are answered out among nature! Here, the scenery starts, heading towards Rohtang Pass from Manali. 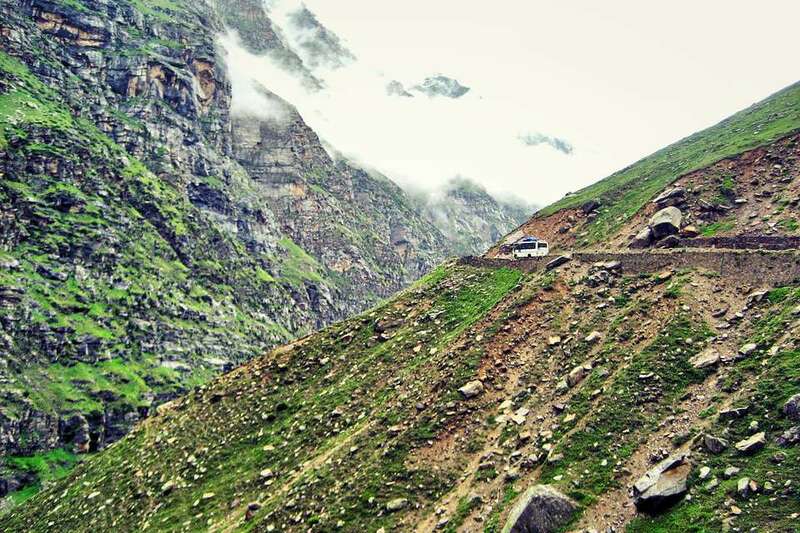 The two-way road leading to Rohtang Pass gets in particularly bad condition during the monsoon season. Delays are often caused by heavily laden goods carriers. However, taking this road is unavoidable. Rohtang Pass is the gateway to the Lahaul Valley from Manali and the Kullu Valley. It's a high altitude area of almost 4,000 meters (13,120 feet) above sea level. Conditions are wet and misty during the monsoon season. After Rohtang Pass, on the other side of the hill, the landscape becomes green and rocky. Chhatru is around half way from Manali to Spiti. It's a popular rest stop with a number of tented huts that serve basic meals, tea, and coffee. The area is so isolated, you can't help wondering where did they come from and where are they going? Dhire, dhire -- slowly, slowly. Signs in Hindi, such as this one, can often be seen painted onto rocks. Their purpose is to warn traffic to drive slowly. Kunzum Pass, at 4,551 meters (14,931 feet) above sea level, is the gateway to the Spiti Valley from the Lahaul Valley. The village of Losar is 19 kilometers further, and the main town of Kaza, 78 kilometers further. It's considered to be auspicious for vehicles traveling through Kunzum Pass to drive around this temple, dedicated to the Goddess Kunzum, on the top of the hill. It provides an attractive place to stop and take in the scenery too! After Kunzam Pass, the landscape is colorfully blanketed with grass and tiny yellow flowers. It's surprisingly common to find different types of animals being herded along the remote road. The landscape again changes on the road to Losar from Kunzum Pass. Losar village is the first inhabited village in the Spiti Valley, on the way to the main town of Kaza. It's located at an altitude of 4,085 meters above sea level. The road from Losar to Kaza becomes very striking. Kaza is the main town and administrative center in the Spiti Valley. It's located at a height of 3,810 meters (12,500 feet) above sea level.